Why did Kim Jong Un recently harden his demands for the summit and stop working on plans for the Singapore meeting with White House and State Department officials? The answer, according to senior administration officials and outside experts, is China. President Donald Trump hinted Thursday that he had an idea why the North Korea summit went off track, telling reporters "the dialogue was good until recently, and I think I understand why that happened." He went on to joke that reporters could write about it in a book. 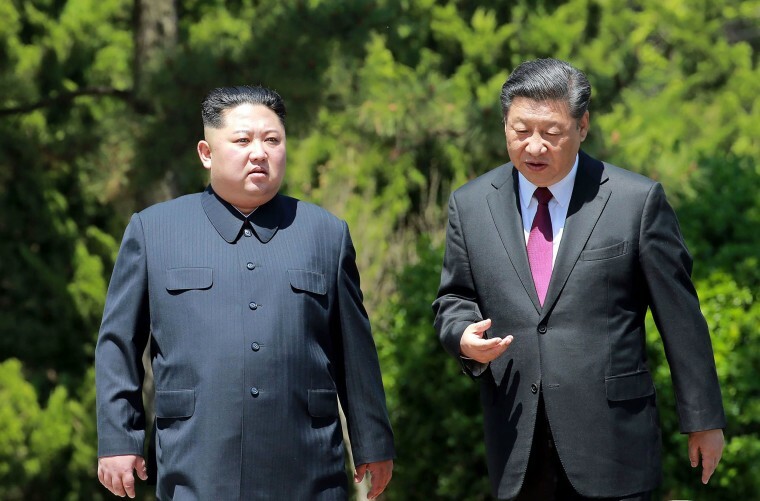 But foreign policy analysts aren't waiting for a book to suggest that Beijing was the hidden hand behind the summit's derailment, as President Xi Jinping became increasingly anxious about the potential reunification of the Korean Peninsula — with China on the sidelines. Trump himself suggested his suspicions two days ago when he was asked about China during an Oval Office meeting with South Korea's President Moon Jae-in. Trump answered: "I will say I'm a little disappointed because when Kim Jong Un had the meeting with President Xi in China, the second meeting ... I think there was a little change in attitude from Kim Jong Un. So I don't like that." He added, "I think things changed after that meeting, so I can't say that I'm happy about it." And, in fact, there was a noticeable change in Pyongyang's public statements and private actions after Kim's second visit to China in two months on May 8, after not having visited China in six years. Why is China so concerned? Retired U.S. Navy Adm. James Stavridis, a former supreme allied commander of NATO and currently the dean of the Fletcher School of Law and Diplomacy at Tufts University, said that "you could feel the air collapse in the summit balloon" after Kim's appearance in Beijing. In recent days, Beijing has also provoked the U.S. by landing one of its bombers on a Chinese man-made island in the South China Sea, which is disputed territory. In retaliation, the Pentagon "disinvited" China Wednesday from participating in biennial military exercises in the region. Analysis: What went wrong for Trump in N. Korea? Everything. Wang Yi, China's top diplomat, called that decision "negative" and "nonconstructive" at a State Department news conference with Secretary of State Mike Pompeo on Wednesday. He said it was "unhelpful to mutual understanding between China and the U.S."
Now, on top of escalating military tension and trade wars with China, the administration will also blame China for scuttling the president's hopes for a historic agreement with North Korea. By most accounts, the White House expectations were unrealistic and set too high. But the diplomatic fallout carries big risks. Many experts see South Korea's Moon as the big loser, having received no warning from Trump that he was canceling the summit today. The South Korean leader, elected on a platform of North-South reconciliation, was heavily invested in the summit succeeding, even putting his reputation on the line by taking Kim Jong Un by the hand to jointly step across the Demilitarized Zone. Trump is also a potential loser, as critics claim he was too eager to accept Kim's invitation for a meeting before he had even been briefed on the details of the offer. The real concern now is unintended consequences, like a return to the bellicose threats between Kim and Trump that seemed to reach a crescendo with "fire and fury" and the New Year's recriminations about the size of each other's nuclear "buttons." "We should all be very concerned about the increasing possibility of a full-on war on the Korean Peninsula," Stavridis said. "That has re-emerged as a very serious possibility."